Paul McCartney is reportedly preparing to bid on the rights to 251 songs that he and John Lennon wrote during the Beatles era. Michael Jackson and Sony Music currently own equal portions of the the publishing and performing rights to the trove of material Lennon and McCartney collaborated on. Indications are that the Jackson estate may also plan to bid for the 50% Stake Sony currently controls. David Geffen and the owner of Warner Music may also be in the hunt for ownership of the songs. 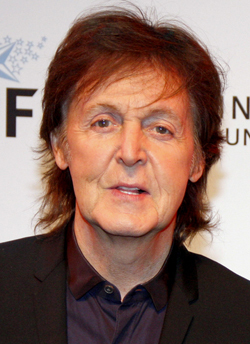 As wealthy as McCartney is, some music industry and finance experts expressed the opinion the former Beatle might have to bring other investors in to compete for the catalog. Estimates are that the portion Sony owns will go for more than a billion dollars.